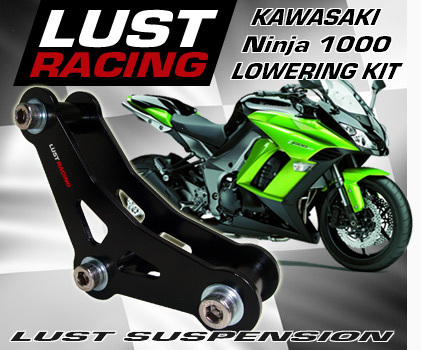 Lowering kit for Kawasaki Ninja 1000 ABS 2017-2019 , Ninja 1000 2014-2016 and Ninja 1000 2010-2013 models by Lust Racing. The lowering brackets replaces the standard suspension rocker arm brackets on your Kawasaki Ninja 1000. Lust Racing offers ride height adjuster kits for both early and late Ninja 1000 models, please select the right kit for your bike. We have all lowering kits for Ninja 1000 in stock. Lower the seat height on your Kawasaki Ninja 1000. Excellent for shorter riders to reach the ground with both feet. Gives the bike a lower and meaner look and improves the rear wheel traction. Increases high speed stability of the bike. Copyright: All content, text, images and code © Lust Racing Limited 2009, 2010, 2011, 2012, 2013, 2014, 2015, 2016, 2017, 2018, 2019. All Rights Reserved.